Compression spring - is designed to operate with a compression load, so the spring gets shorter as the load is applied to it. Compression springs are found in a wide variety of applications ranging from automotive engines and large stamping presses to major appliances and lawn mowers to medical devices, cell phones, electronics ,sensitive instrumentation devices & etc. Helical Compression Springs are the most common metal spring configuration. Generally, these coil springs are either placed over a rod or fitted inside a hole. When you put a load on a compression coil spring, making it shorter, it pushes back against the load and tries to get back to its original length. Compression springs offer resistance to linear compressing forces (push), and are in fact one of the most efficient energy storage devices available. 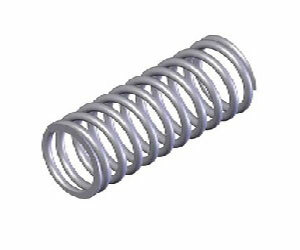 Akar Spring Works manufactures all types of compression spring as per the clients requirements. Our team of experts and quality control personnel monitor each stage of the production of compression springs, to ensure that the requirement is fullfilled. Get an urgent quote for your requirement in 2 hours. Dedicated team for urgent orders. 4, State Bank Colony, Hingna Road, Nagpur, Maharashtra - 440016, India. Copyright © AKAR SPRING WORKS. All rights reserved.